Feed your berry plants the proper fertilizer. Learn more about fertilizer in this slideshow. Fertilizer for strawberries replenishes nitrogen, phosphorus, and potassium in the soil. Whether you're an organic gardener or choose conventional methods to grow berries, there are many choices of fertilizer. Out of all the fruit one can grow in the garden, strawberries are perhaps the best-loved. The ripe, juicy, sweet red fruits are the harbingers of summer. Strawberries can be grown in almost all gardening zones, and even a few plants can yield tasty berries their first year. To understand how to fertilize strawberries, it helps to understand how strawberries grow. All strawberry plants are generally shallow-rooted. This means that the plant doesn't put down deep roots. Because the roots grow near the surface, the plants tend to use up the nutrients near the top of the soil very quickly. Unlike a tree, which can send its roots deep into the ground to find additional nutrients, strawberries are stuck with what's available to them. Plants display several clues when they need fertilizer. Learn how to read your strawberry plants' signals correctly. Some of these clues may also point towards insects or other problems, so be sure to consult a local gardener or someone at your local garden center if your plants continue to struggle. Pale or yellow-colored leaves: This may indicate a strawberry plant needs fertilizer. No berries: Plants may produce flowers, but berries either fail to develop or never develop at all. No flowers: The plants look green and healthy, but never flower. There are several fertilizer choices great for strawberries. Compost is a rich, natural fertilizer that strawberries love. Compost is an organic fertilizer and soil amendment made by nature decomposing leaves, grass clippings, and other plant material. You can add shredded newspaper, discarded outer leaves of lettuce, apple peels and any other vegetable material from the kitchen into the compost pile. Over time, heat and moisture encourage microbes to break down the plant material, and worms chewing their way through the pile leave behind casings, or droppings, that add rich material to the soil. Compost is an excellent all-around soil amendment and recommended for nearly every garden. Whether you make your own compost or buy it bagged at the store, add a layer of compost about one to two inches thick to the soil before planting strawberries. Commercial fertilizers contain a chemical blend of nitrogen, phosphorus and potassium, along with some trace minerals. Fertilizer bags list these elements as numbers in a ratio such as "5-10-5" and "10-10-10". The numbers reflect the percent for each element, with nitrogen always the first number, phosphorus the second, and potassium the third. If choosing a commercial fertilizer for strawberries, look for a balanced fertilizer. A balanced fertilizer will show all numbers as the same, like 5-5-5 or 10-10-10. The safest fertilizer for strawberries is a 10-10-10. Use about two and a half pounds of 10-10-10 fertilizer for every 100 feet of rows of strawberries. Broadcast or sprinkle the fertilizer around the plants and follow the package directions. If the leaves on your strawberry plants turn yellow within a month of planting them in the garden, apply a 10-10-10 fertilizer. You can fertilize in the spring and again in the fall. Getting a soil test done at your local county cooperative extension office is a great idea to ensure that you're neither over fertilizing nor under fertilizing your strawberry plants. For more information about growing and fertilizing strawberries, the following resources may be helpful. 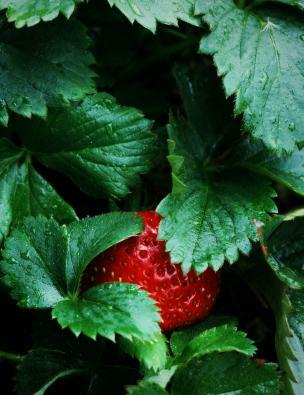 North Carolina State University System provides growing and fertilizing tips for strawberry cultivation, with an emphasis on southern gardens. Strawberry cultivation on the DIY network. Essential Garden Guide provides care information for strawberries.